We would like to thank the Black Liquor Recovery Boiler Advisory Committee (BLRBAC) for allowing us to present our patented Sootblower Fouling Detection (SFD) technology at the Spring 2019 meeting in Atlanta, GA. SFD is ITM’s patented technology for measuring fouling/slagging along the path of an active sootblower in recovery and utility boilers. 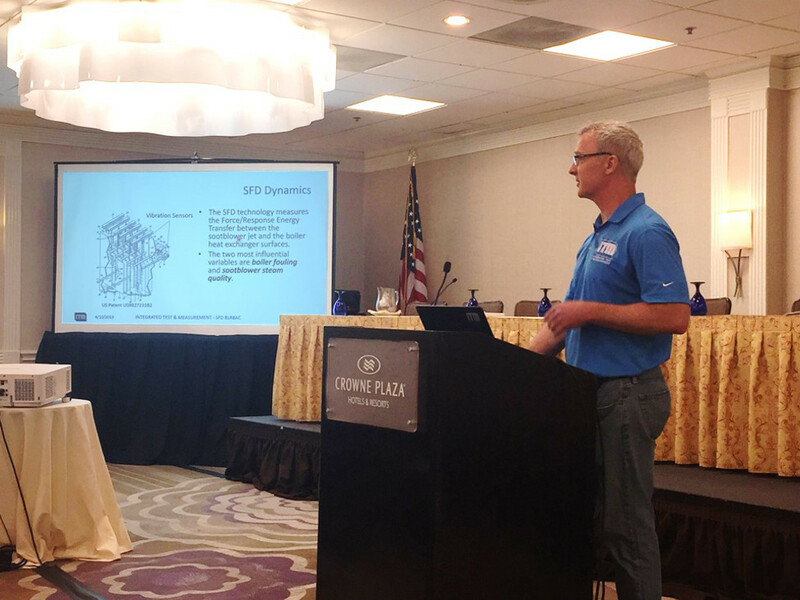 During this presentation, Tim Carlier described the original SFD concept, the system’s Key Performance Indicator (KPI) outputs for closed or open loop control, and the system’s potential sootblower steam savings of 1-4% MCR. He also highlighted the safety and maintenance benefits that the system provides. For more information about the SFD technology or to schedule an online presentation or site visit to audit your specific application, contact Tim Carlier or Ryan Welker. The NI-9202 Voltage Input Module can now be used with the latest version of iTestSystem (16.1). 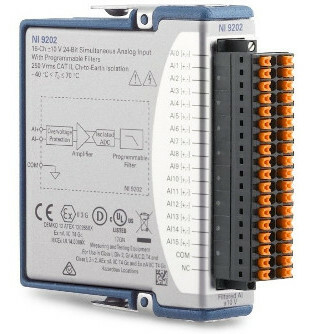 The NI-9202 has excellent flexibility to meet the needs of your applications. The module has 16 simultaneous sampled, +-10 V, 24-bit differential input channels for creating large, distributed systems in a rugged form factor. The NI-9202 has a maximum sample rate of 10kS/s and features configurable filters to eliminate noise in your system while maintaining low-latency in control systems. Click Here for more information about iTestSystem. For advice about using the NI-9202 versus other voltage modules in iTestSystem monitoring applications or with custom cRIO RT and FPGA control applications contact Mark Yeager or Chase Petzinger. Integrated Test & Measurement (ITM) is presenting its patented Sootblower Fouling Detection (SFD) technology at the Spring 2019 Black Liquor Recovery Boiler Advisory Committee (BLRBAC) meeting in Atlanta, GA on Wednesday, April 10, 2019. Our engineers and technicians use National Instruments (NI) CompactDAQ (cDAQ) hardware and our iTestSystem software to collect structural, vibration, and temperature data for lab and field tests. Many of these tests are unique and require different variations of data acquisition hardware and sensors types. As you can imagine, we have accumulated quite an inventory of cDAQ test equipment and sensors from these tests. This inventory includes both cDAQ chassis and C-Series voltage, strain, vibration, and temperature modules. For our iTestSystem users, we offer a data acquisition equipment rental service for available cDAQ hardware from our inventory. If you need additional equipment to complete a design validation test or to troubleshoot a structural problem, check with us to see what equipment is available. Click Here for more information about Equipment Rental. For more information about eligibility, equipment availability or to request a quote contact Josh.Fishback@iTestSystem.com. Plant operators need to continuously measure bulk material levels/weight to make sure their processes are running safely, efficiently and without any bottlenecks. Measuring these levels allows operators to automate vessel filling/emptying logistics or verify that a process is using the right amount of material. 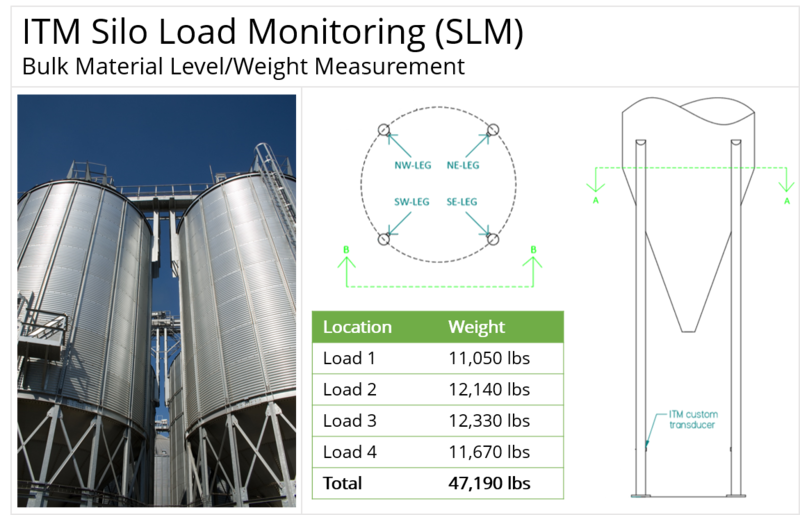 How do you measure bulk material levels/weights in silos and hoppers? There are a variety of bulk material level/weight monitoring sensors in the market. These sensors include distance measuring devices like laser, ultrasonic, and radar; or weight measuring devices like load cells and strain gauges. Our engineers prefer to implement strain gauge based solutions because they are very accurate and do not require structural modification. For these solutions, our engineers identify the silo/hopper load paths and our technicians install strain gauges at these locations. By calibrating the strain gauge sensors to load and summing the load data for all load paths, we can accurately measure the total weight of the bulk material. A typical silo monitoring system consists of weatherproofed strain gauges for each silo leg and a National Instruments (NI) CompactRIO embedded controller for inputs, calibration, and outputs housed in a stainless steel enclosure. For more information about silo monitoring, contact Ryan Welker @ 1.844.837.8797 x702. To see how ITM’s structural load monitoring systems work watch this video. I’m excited to announce that we’ve grown our engineering group with the addition of Zach Rucker. Zach’s primary role at ITM is as a field engineering technician where he assists with the installation of our industrial monitoring solutions and fulfillment of our field testing applications. In addition to his work in the field, Zach stays busy in our instrumentation lab assembling and testing custom control panel assemblies, installing strain gauges on custom load cells, and building and testing customer specific monitoring and measurement systems. We welcome Zach to our team. You can read more about our entire team here. The latest video in the ITM Live Demo series shows users how to configure an Ethernet/Network cDAQ or FieldDAQ chassis with NI Measurement & Automation Explorer (NI Max). One of the most common questions we get from iTestSystem users; How do I configure my network/ethernet cDAQ or FieldDAQ chassis? In this video, Chase Petzinger demonstrates how to change a cDAQ’s network settings. If you’re interested in learning more about iTestSystem and networked cDAQ chassis measurements, feel free to contact one of our test specialists by e-mail at info@itestsystem.com or phone at (844) 837-8797. The US patent office has recently awarded patents to ITM for (2) two of the underlying boiler safety and process optimization technologies embedded within our CDS and SHOP systems. These systems monitor boiler conditions and alert operators when boiler tube damaging events/conditions occur. The Clinker Detection System (CDS) measures the relative weight, location, and frequency of clinkers that impact a boiler floor. This technology enables operators to shorten boiler outages, identify fouling problems, optimize soot blower operations and identify damaging impact events. The Superheater OverHeat Protection (SHOP) system helps mitigate the risk of superheater tube failure due to short-term overheat during boiler start-ups. 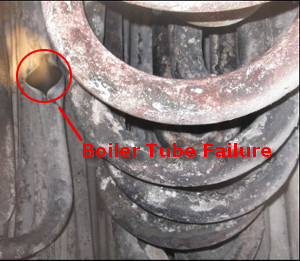 Catastrophic thin-lipped bursts can occur in superheater steam generation tubes when steam flow is insufficient, when deposits restrict flow, or when tubes are blocked by water due to a rapid firing rate during boiler start-up. SHOP assists operators in the management of boiler start-ups by enabling the detection of superheater tube clear events (TCE’s). If you’re interested in learning more about these systems and other boiler/process monitoring solutions, feel free to contact Ryan Welker by e-mail at ryan.welker@itestsystem.com or phone at (844) 837-8797. The NI-9242 single ended voltage input module can now be used with the latest version of iTestSystem (16.1). The NI-9242 C-Series module features three (3) voltage inputs plus one (1) neutral input, 24-bit resolution, 250V rms L-N, 400V rms L-L, and 50 kS/s/ch. 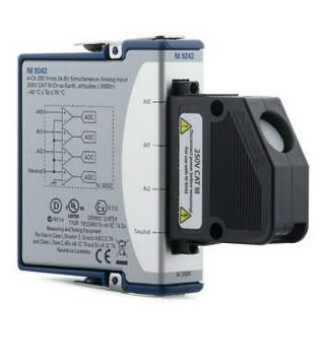 The measurement range (250V rms L-N or 400V rms L-L) makes it ideal for embedded 120V rms and 240V rms grid measurement applications such as phasor measurements, power metering, power quality monitoring, industrial machinery, motor testing, and transient or harmonic analysis with high-speed (50kHz) simultaneous sampling. For advice about using the NI-9242 in stand-alone power quality applications or cRIO power monitoring applications contact Mark Yeager or Matt Satcher. In the latest release of iTestSystem (v 16.1), we are adding the NI-9246 current input module to the compatibility list. 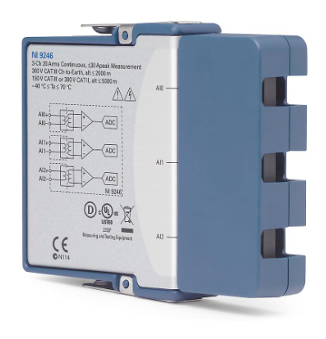 The NI-9246 features 3, 22 Arms continuous current inputs, 24-bit resolution, and 50 kS/s/ch in the C Series form factor. The measurement range (22 Arms ) makes it ideal for three phase current measurements from 1A and 5A current transformers. These types of measurements are used in embedded industrial, power generation applications like power quality monitoring and machine condition monitoring.